Get a glimpse into the life of Jackson Douglas . . . before he was a private investigator. Short Sail is a fast-paced but lighthearted adventure that takes you back five years before the full-length novels in The Douglas Files, and also serves as a prequel for Book Seven. Jackson Douglas and Tori Walker are little more than paper pushers when their detective firm stumbles upon a scam artist. Since the company lacks the motivation to pursue him, the would-be private investigators decide to take matters into their own hands. During trips to the beach and over dinner at her apartment, they hatch a plan to con a conman not once but twice. Can Douglas and Walker pull off their complicated confidence game on short notice, with limited funds and minimal resources? Will their chemistry work for them or cause a distraction? What happens if the scammer spots the scam? And is righting a wrong really worth the risk—a risk that could put them on the wrong side of the law, or worse? 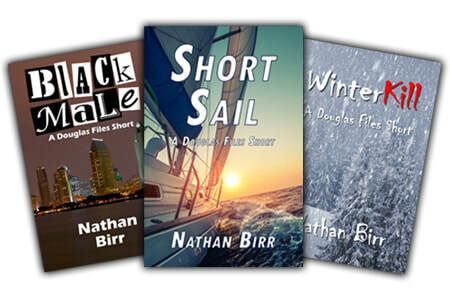 Get Short Sail now!​ - Also available in Paperback. Black Male takes you back six years, to when Jackson was a paper pusher at MTR Investigative Service in San Diego, and that for all of three weeks. But when a potential client shows up late one Friday, he offers to help. Reggie Cameron shows up one Friday night, Jackson is the only associate available, and offers to help. Reggie is weeks away from opening a new restaurant, and his ex-wife’s sister, Leila, wants in on the action. Unless Reggie makes her a partner, she plans to tell the world that he stole twenty-five thousand dollars from her stepfather—and Reggie’s former employer. Reggie insists he didn’t do it, but fears Leila will use his past to stereotype him as a thuggish black jock, adding credence to accusations that could ruin him before his new career gets started. Since none of the pros at MTR are available to take the case, Jackson is left to work alone. Hoping to prove Leila is actually the thief, he spends his Saturday tailing her and observes unusual behavior that appears to tie her to a local crime family. Despite the danger, Jackson pushes on, determined to help Reggie for reasons he can’t explain. Will he incriminate Leila in time, and in his efforts to do so, will he end up pushing too far? WinterKill travels back two and a half years to Jackson's weekend ski trip with a trio of beautiful women, all of whom seem to have it in for Jackson, and one of whom is being hunted by killers. Jackson’s brother’s fiancée, Hillary, has been receiving death threats, likely tied to her career as a defense attorney. Getting away for a relaxing weekend seems prudent until they find evidence that someone is following their group. Hillary refuses to turn back, which puts Jackson on edge, seeing snipers behind ski lifts and questioning the loyalty of his traveling companions. And when a heavy snowstorm strands them all in their palatial cabin with a mysterious stranger, his paranoia seems perfectly apropos. As the night wears on, fears become reality. Killers breach the cabin, forcing the group to use whatever means necessary to fight for their survival. As dawn nears, they hatch a plan to save themselves. But will they escape from danger, or place themselves in its very midst?